Will you have snow for Christmas? There is nothing like the white stuff to sparkle in the darkness. Mal here, and Mackinac Island loves snow for Christmas. The carriages all change to sleighs with runners and jingle bells on the reins. The sounds of snowmobiles fill the air. I like to go sliding through the snow. It has great smells and I can find the most interesting things. 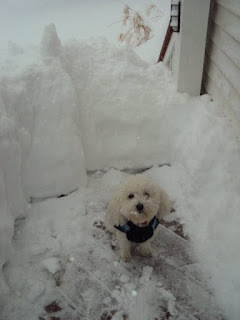 Of course, it's not as much fun when the snow is deeper than me. Then I'm stuck using the shoveled walks and porches. Okay, here's the part where I tell you, it's that time of year again, when my writer gives away a book for the holidays. This time she is going to give away two books- one for you and one for your relative or friend. AND - there will be two winners who will get a book for them and a book for a friend. All you have to do is leave a comment below. Tell me who you would give the extra book to and why. Then have very happy holidays from me, Caramella, Allie, and all our friends on Mackinac Island. I love this series! I live about 4-5 hours away from Mackinac and would like nothing more than to visit! It is such a magical place! In winter it must be breathtaking! If I win, I would give the extra book to my daughter, Ashleigh for Christmas. I am starting to get her interested in cozy mysteries! Thank you so much for this and I hope you have a lovely day! I used to live nearby Mackinac and it is so beautiful. I would give the book to my daughter Alicia. She is a bit poor and loves to read. I would give the copy to my mom. She's a fan of cozies & I know she'll enjoy this story. I love this series! I can picture Mackinac Island and the fudge shops, it's such a beautiful place. I would share with my sister who is my reading buddy, we share books and talk books all the time. Happy Holidays! I'm in the process of putting together a box of books to send to my niece who is an avid reader. I would give it to my friend from my old job. She likes the same type of books I do. I would give it to my mom! She instilled my love of reading. Love your books!!! Thank you for the chance to win. I would give the book to my neighbor - she loves to read mysteries! Thanks for the chance to win your book. I would love to read it! I would give my extra book to my friend, Karen, a manager at a community library. There budget is always being cut so she can always put a donated used book into the system where many can enjoy it...OR I would donate to the homeless shelter...I love doing that! I kind of think of it as food for the soul...OR leave it in the USO lounge to be enjoyed by the troops and their families. I would give the extra book to my father-in-law's wife. She reads almost exclusivvely true crime books - once gave me like 2-3 bags full of books she had read and didn't want anymore. She needs to widen her reading horizons, and learn there are some decent folks in the world. Our three rescued furbabies don't like snow (heck, they hate rain) So, thankfully, we rarely get snow here in San Angelo, Texas! Thanks for the opportunity as I would love to give a copy to my sister. The extra book would go to my friend Judy who loves mysteries as much as I do. Thanks for a chance to win. I'd give the extra book to my sister. Also a great reader. I spent summer vacations at Mackinac for years. Your books take me back to a wonderful time in my life!!!! I have a dear friend who always remembers me when she gets an extra book and I reciprocate when I do so too. I'd give the extra book to my sister. She loves cozy mysteries as much as I do. I would give the extra to my bestie, Tamara! She is a big cozy mystery reader. She is why I got into reading cozies. We have snow here, about a foot of it, with more on the way. Unfortunately, we usually have snow until at least the beginning of April. By that time it doesn't seem so beautiful anymore. 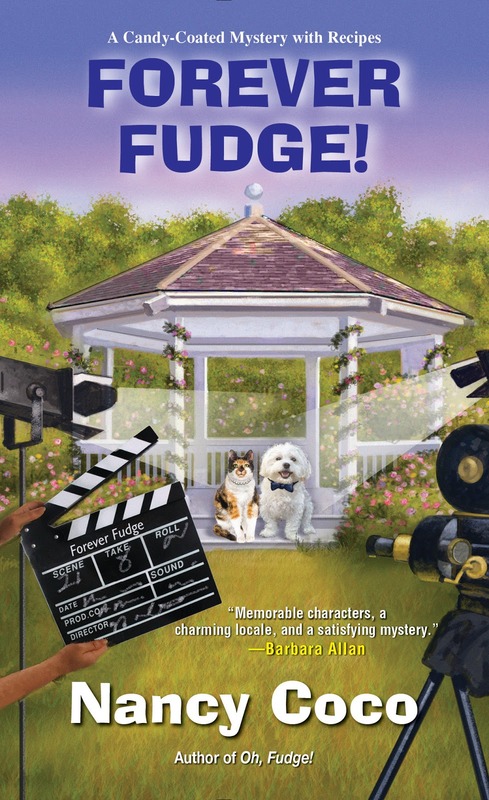 If I were lucky enough to win, I would give the extra book to my friend and former library colleague, who is the one who introduced me to the cozy mystery genre.